A ritual is a stable and balanced regularity whether it is executed daily or once-in-a lifetime; it is grounding and rooted. A ritual, no matter how simple or composite, is a time to unite with prodigious consciousness and the senses. The experiences are meant to be pure, or sattvic. Stability and purity are two qualities that can invite all type of body type of all ages into a state of healing. 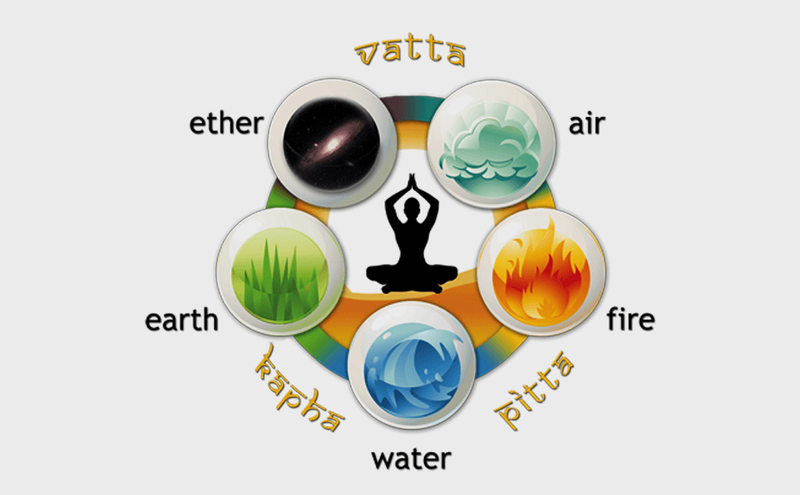 According to Ayurveda Sarvam dravyam Panchabhautikam, all creation arises out of five great elements known as mahabhutas. Our body is also formed by the panhca mahabhutas. Ayurveda’s wisdom is simple: Stay aligned with nature—your own true nature—and you will experience greater health and happiness. To keep these five elements balanced, these five simple activities can become daily rituals for your own healing and sanity, and can be easily made into a family ritual. Drinking a cup of warm water first thing in the morning is great for improving digestion. The warm water serves to stimulate the gastrointestinal tract and peristalsis—the waves of muscle contractions within the intestinal walls that maintains bodily flow. The fire element is representative of agni, which helps us digest our food and transform all of our life experiences into memory. Ayurveda suggests eating meals with full attention on your food for optimal digestion. The first step is to turn off or turn away all electronic devices while eating and say a prayer before meals to awaken our digestive fire. Brahmamuhurta or amritvela—the ambrosial hours— also known as God’s Hours is the one-and-a-half-hour period before sunrise. After a good night’s sleep, the mind is refreshed, calm and serene. At this time, there is a preponderance of sattva or purity in the mind as well as in the atmosphere. Sleeping later than 6:00 a.m. causes the channels of communication to be clogged with impurities, leading to depressed moods and slow communication between the heart, soul & mind. Making this a daily ritual can bring about great changes in your mood and even your biorhythms. The fresh air will fill your body with prana and help you connect with your inner self. Ether creates the space for the other elements to fill. The mind is composed of ether. While the mind becomes easily disturbed, ether represents the substratum upon which thoughts and emotions ride like waves upon the ocean. The sattvic or undisturbed mind is the essence of ether. Whether it’s chanting OM alone in a morning practice, your favorite chant, or Meditation, it keeps the ether element in a balanced state, boosting our mood and energy. Ah, how important it is to keep all special rituals going to check in with our souls, and make sure we are on the right track to leading the life we want.